Sometimes life takes us in a circle. I had been searching the world over on the internet for an affordable industrial strength sewing machine. I wanted to be able to sew through thicker items. 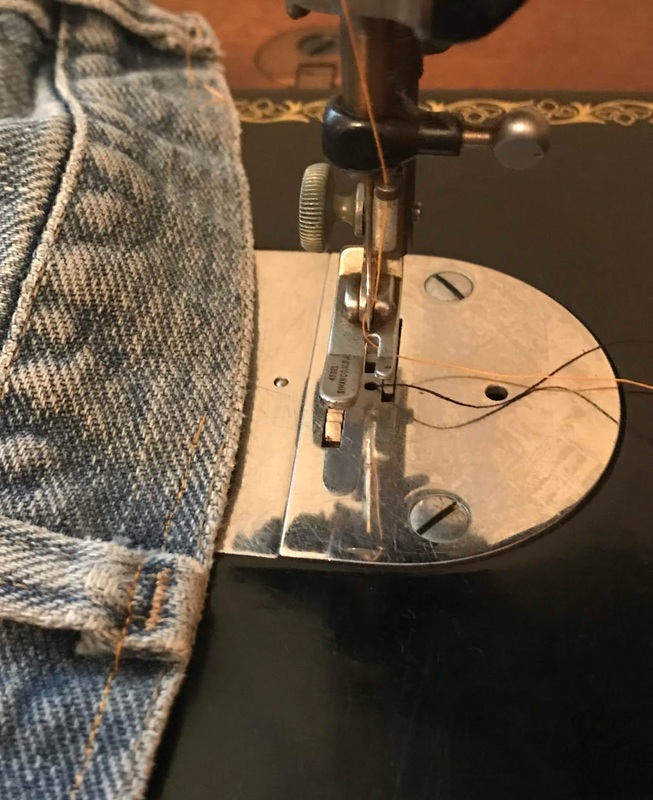 The machines I had were not able to sew through the thicknesses of fabric in order to make a strap for a purse or tote bag or even to hem a pair of jeans. A few years ago I found an older machine on Ebay that the seller claimed was industrial strength. Well, $40 later I had a very heavy all metal vintage machine. I do not know the year it was manufactured. Although it did sew, I was disappointed to discover it could not handle the thickness of materials that I needed it to. It was not "industrial" at all. So, I just resigned myself to the fact that I would not be able to make some items. Fast forward to about six months ago my husband needed a belt loop sewn back on his jeans. My sewing machines could not handle that. I do have an electronic machine that does very well with decorative stitching that I like very much, but she is not a work horse. She's more like a kitten that purrs along. I was frustrated with not being able to properly repair the jeans. I did a "make do" repair that ended up looking like a redneck joke. But, it was functional. His pants do stay up. Thank goodness! I was once again on the lookout for a machine that could handle thick materials. I happened on a used vintage machine in a buy-sell group on the internet. Once again I do not know the year. It looks like late 1960's or early 1970's. It too is all metal. This one was only $20, but so far I had to purchase the manual on-line for $5 (no free one's are available for this machine). The feed dog was broken. So I have ordered a replacement ($14). Once that comes I will see if I can get the machine to sew correctly. I have learned my lesson--no more used machines for me, unless it's a collectible and I can afford it. In the meantime while I was waiting for the feed dog to arrive I started perusing brand new industrial machines. I discovered they're not so affordable. Then I noticed my mother's sewing machine cabinet in the corner of the dining room. The machine had not been used for many years, but my mother always told me it still works. I decided it was time to find out. 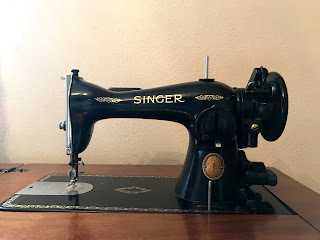 The machine I am referring to is a Singer 15-91 sewing machine manufactured in 1952, which my mother purchased brand new in 1953. The original manual is still with the machine, as well as the buttonhole attachments that came with it. This is the only sewing machine she has ever owned. I remember learning to sew on this machine when I was seven years old. She sewed many clothes for her children and I sewed with it until I was in high school and didn't have time for it any more. I opened up the machine and it looked good. It just needed to be dusted off. So I dusted it and oiled it. I had to refer to the manual, because unlike the new plastic machines, this one uses oil in a lot of different places. Once that was done I pulled out some scraps of denim to see what it would do. It only has the capability of the straight stitch. It went through two layers of denim easily. The tension was perfect, the needle was the same one that had been in the machine for many years. It did so well that I doubled the denim. Four layers of denim and it didn't hesitate. Six layers were a breeze too. Eight layers I thought might be too much. I was wrong! It went over the thickest part of the belt loop attached to the jeans easily. To say I was impressed is an understatement. I looked through the manual to see if there was some helpful information and I discovered that this machine will also free motion quilt. That was another thing that I have been wanting to do for years. I tried it out on a two foot square quilt sandwich scrap. It did extremely well and it was much easier to quilt on this Singer 15-91 machine than on the newer machines. I am thankful that I did not sell this machine years ago when my mother suggested that I should. Something else that is worth noting is that my mother never knew it was capable of doing these things either. She said, "it sews nice dresses." It does so much more! If you have an old machine I encourage you to get it out and see what it's capable of. You may find out that it is not just a decorative item to set a doily and a plant on. It has a purpose beyond that. I wasn't aware that I already had what I was looking for because I never took the time to find out that it was capable of more than I had ever imagined. My mom still uses her old singer. I wonder how many layers it can handle?